When it comes to sports nutrition, we are usually concerned with the right fueling before workout — then as soon as our training is over, we eat whatever we can get our hands on. But what we put in our bodies post-workout is what we should focus on the most. 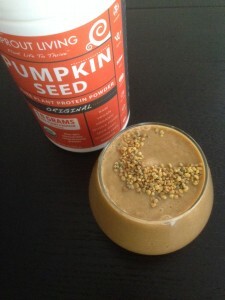 Here is one great smoothie, easy to whip up in minutes for proper and speedy recovery. Pour into a glass jar and hit the road to work! Carbs. Protein. Fats. We know we need all three for basic existence and thriving, and when it comes to proper post-workout recovery, we need these three macronutrients in the right ratios. Carbohydrates break down into glucose, and when consumed after exercise, glucose is the preferred source of energy for replenishing the muscle glycogen. Protein is needed for tissue and cell regeneration. Our body converts the protein into essential amino acids which are to be used for repairing and rebuilding muscle tissue. To get a complete amino acid profile, it’s best that we consume a variety of foods like sprouted nuts, seeds, beans, tempeh, and whole grains. Dietary fat must be broken down into fatty acids so that the body can utilize it for fuel. When our body’s carbohydrate sources are low, we draw energy from the dietary fat. Food rich in essential fatty acids include flaxseeds (always use grounded); hemp seeds, pumpkin seeds, sunflower seeds, walnuts, almonds and chia seeds. Consuming 4-to-1 ratio of carbohydrates-to-protein is ideal for quick muscle glycogen replenishment, and this smoothie provides your muscles exactly what they need. * Bee pollen is touted for its many benefits, and is especially good for athletes because it increases strength and stamina in the most natural form.